Match the action of your fly to the action of the natural for a complete imitation that will entice a fish. The Stimulator is a versatile fly that can be used to imitate several different insects. With a dead drift, the Stimulator floats with the typical stillness of a grasshopper blown onto the water. But, when the drift is altered by the introduction of action, the fly becomes an ovipositing Stonefly striking the surface of the water to release its eggs. The fish were keyed onto this insect and its behavioral characteristics. The prevailing thought seems to be that dry flies, especially mayfly duns, should be presented with a dead drift, which delivers no action to the lure at all. Anglers acknowledge that caddis hop or skitter on the water before taking off. Even so, most of the anglers I watch habitually use a dead drift for anything they float on the surface. Despite this, March Brown, Gray Fox, and Green Drake duns are tied to represent mayflies that move on the water instead of floating immobile before springing into flight. Egg-laying females of many insect species hit the water to dislodge their eggs, and some even dive under the surface. I’ve only mentioned dry flies here, but nymphs and emergers are also divided into categories of action. Many fly fishers use the same technique to fish most of their flies: drifting dries, nymphs, and even streamers at the speed of the current and occasionally remembering to tug on the line a little for some added action. But, each natural insect comes with its own behavioral traits, which make an imprint on the fish. If the imitation does not act like the real thing, the fish will not look at it. Match the action of your fly to the action of the natural it is imitating. An important step in the preparation for a day of fishing is determining which insects will be active on the water. Find out not just the name of the natural, but its typical characteristics as well. Match the action of your fly to the action of the natural for a complete imitation that will entice a fish. For example, when fishing in March Brown season, be prepared to cast your lure into the riffles and swim it with a technique that alternates between raising and lowering the nymph to imitate the swimming movement of the natural, then drifting the fly motionlessly to mimic the frozen body of the natural caught in the current. Even if you did not refresh your knowledge of insects and their movements before getting on the water, take a first-hand lesson from the naturals that are active while you are fishing. You won’t be able to see the subsurface activity of the nymphs, but you can observe the insects on top of the water. If they are jumping or actively moving on the surface, give your dry fly action to match. To mimic a natural insect, be aware of the kind of movement you can impart to your imitation fly when manipulating it in the water. Familiarize yourself with the action by dropping the fly to the water near you, but make sure it is tied to your leader first. Move the fly, retrieve it, watch it drift. Study the motion of your lure for a few minutes. Once you know what your imitation can do, play with it so as to simulate the action of the natural insect you are trying to match. See what happens when you twitch the rod or strip in line. Nymphs can be sorted into a few categories with similar characteristics. Learn the traits of each category, determine which category matches the active insect, and you will know how to fish your fly. Guide TipThe first question to answer before presenting any fly is: dead drift or live action? You are trying to imitate what the natural insect does. Does the insect drift with the current, necessitating a dead drift presentation of your fly? Or does the insect move, requiring live action in the manipulation of your imitation? Certain netspinner larvae move downstream from stone to stone by means of a rappelling white or light brown silk. To imitate the silk, whiten the first six inches of the tippet above the fly. I use a White-Out pen. Attach split-shot a few inches above the whitened tippet. When drifting the fly, move your rod tip gently up and down to hop the weight downstream. The nymph will appear to move from rock to rock by using its fine silk as a rappelling rope. Just before emerging, clingers migrate from the faster current to slower water, where they swim actively. Work your fly to the front and sides of rocks where fish might be holding. Concentrate your fishing in pocket water and just below the riffles. As the water warms, crawler larvae move about actively. They climb to the top of subsurface rocks, where they are more exposed to the current and to trout. When adrift in faster water, the insects remain rigid and should be dead-drifted. In slower currents, the naturals swim awkwardly. Introduce action through a retrieve or rod movement to animate the fly. Swimmers are active insects that move quickly. Try various techniques for adding movement when you drift these nymphs. At the end of the drift, swing the fly toward the stream bank. 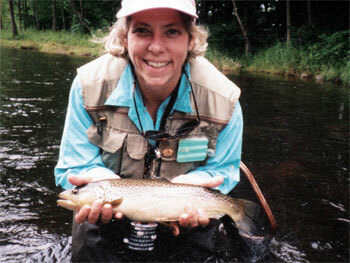 Allow time for fish to follow and take the fly before pulling it out of water. To add action to a nymph on a windy day, tie on a fluffy strike indicator. Grease it with floatant. Do anything to give it a high profile. The strike indicator will bob on the surface waves and when the breeze blows. The nymph will in turn bob up and down under the water’s surface. If the insect emerges from the bottom, it springs from the riverbed to the surface. When it reaches the surface, it may drift while shedding its pupal skin or immediately run or hop across the water to launch into the air to reach a rock. If the insect rests at the water’s surface before transforming to its adult stage, it is a surface emerger. Adult insects are imitated with dry flies drifted on top of the water with action that matches their behavioral characteristics. If the natural insect drifts motionlessly on the water’s surface as the wings dry in preparation for flying away, float your fly on the current with a dead drift free of drag. If the natural moves across the water propelled by its own energy, perhaps fluttering its drying wings or hopping on the surface in preparation for taking off, present your imitation with live action. Techniques for giving live action to a fly are limited only by the conditions of the environment and the features of the fishing gear. A. To present with a high stick and wiggle, raise rod tip in the air to about eleven o’clock. B. Strip in line while wiggling the rod tip. The best place to skate a fly is in the tail of a pool, where the water is fast but smooth. Grease the fly and the tippet with floatant. Cast the line across or downstream. Raise the rod tip in the air to move or skitter the fly a few inches at most. 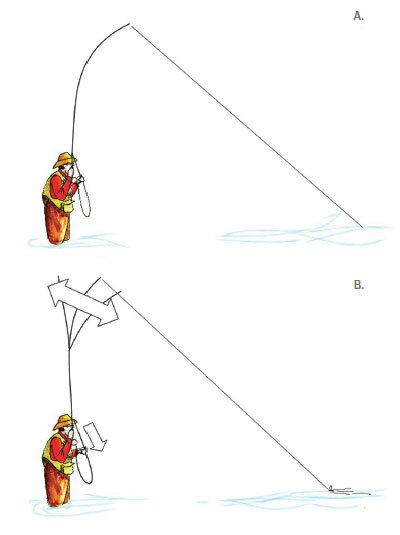 Lower the rod tip while retrieving slack. Repeat the last two steps until the fly is close to you. Another way to add skating action to a dry fly is the high stick and wiggle presentation. Choose a fly with a thick hackle that will hold the body of the imitation just above the water surface. Make sure that your tippet is one size heavier than usual, as takes from fish can be explosive with this presentation method. Grease the tippet with floatant or line dressing. Cast across and downstream with a straight-line cast. 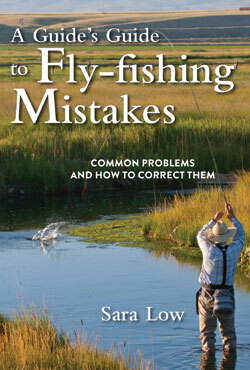 As soon as the fly hits the water, raise your rod arm in the air until your rod tip points to about eleven o’clock. Strip in line while wiggling the line with your rod tip. The fly will skip across the surface. After you skate the fly for three or four feet, drop the tip of the rod and follow the line downstream. This technique is very effective for attracting fish taking active insects. The drag-free float gives the fish a chance to inspect the prey, and another wiggle usually drives it to the surface. Skating a fly does not work well on riffled water because the broken surface pulls the fly under. It also does not work well in slow water where fish are easily spooked and have more time to inspect the fly. If you are imitating an ovipositing caddis or stonefly, drop your fly heavily onto the water to match the natural insect’s behavior as it lays eggs. Twitch the fly and let it rest, then twitch again. If you are fishing with terrestrials, present with a plop, but twitch less frequently. Terrestrials get caught in the film layer on the surface of the water and, if small or light, have a difficult time moving. Wet flies can also be fished with either a dead drift or simulated action. If you are not sure of the behavioral characteristics of the naturals that are active in the water while you are fishing, try both methods. Cast across the current and slightly downstream of where you are standing. Let the fly drift with a dead swing, no action. After casting a few times to the same water with a set length of line, cast to the same spot again. This time, however, add movement to your fly as you retrieve: Strip in a few inches of line, stop, strip in a few inches of line, stop. Try three or four casts and action drifts across the identical path. Then lengthen your line by a foot, and repeat these steps. Continue until you have covered the area. Streamers are tied to mimic smaller fish, leeches, and other creatures swimming in the water. They can be fished with a dead drift or live-action presentation. To cast streamers or heavily weighted flies a distance, do not false cast, as the heavy fly may pull the line down and cause the hook to catch on it and tangle. To avoid creating a bird’s nest, pick the line up off the water in your back cast and drop the line back to the water after the forward cast. Without giving the fly time to sink, make another back cast. Shoot line to lengthen the cast, and let the line drop to the water again on the forward cast. Continue this casting until the line reaches the desired length. Then, fish your fly. To dead drift a streamer, cast the fly across the water and slightly downstream from where you are standing. Let the fly swing in the current without adjusting the line or the fly: no mend, no tug, no retrieve. After a few casts with a dead-drift swing, cast the fly to the same water, and retrieve it with a lifelike motion. Secure the line under the index finger of your rod hand. Reach with your line hand to hold the line leading from under your index finger to the reel. Strip a few inches of fly line from the water by tugging with your line hand. Drop the line that you retrieved to the water between your reel and where the line is secured by your rod hand index finger. Stop and let the fly drift a little. Strip in a few inches of line again. Repeat this technique until most of the line has been retrieved. Draw the attention of larger fish by creating your own food chain: a small baitfish being chased by another. To achieve this effect, attach a weighted streamer to the end of your leader. Add an unweighted streamer as a second fly by tying it to the bend of the hook of the first fly. Cast the two flies. Let them sink for several seconds before beginning your retrieve. Use an animated tug to retrieve the flies. It is wise to start your fishing by aiming at targets closer to your position and casting to distant targets afterwards, so the fly line does not disturb the water you plan to fish later.